In an effort to help our children find their place in and feel secure within their community while raising visibility and understanding of our younger members of society, we aim to initiate and participate in local cultural events. Additionally, as parents of young children, we want to keep our network of support and friendship strong and ever-growing. We hope to create opportunities for families and parents to learn and play together, as well as possibilities for parents to enjoy some time on their own. We look forward to hosting and participating in events within Santa Rosa, Sonoma County, and all of Northern California…stay tuned and please keep us posted as well! *4/22: Earth Day Beach Clean Up Field Trip to Doran Beach! *3/26: Parent Ed Night with Renee Valentino @ Sally Tomatoes in Rohnert Park! *2/14: Love Lunch Family Pot Luck Picnic! *12/18: Nutcracker Ballet Field Trip! *12/8: 9th Annual Mixed Greens Mixer Holiday Party! *11/27: Dine & Donate at Steele & Hops, benefitting the Butte County fire victims, through The Schoolbox Project. *10/23: Field Trip to the Great Peter Pumpkin Patch at the Petaluma Creamery! *10/3: Mixed Greens OctoberFest! Drink & Donate at Juncture Tap Room 4-9pm! *4/4: Dine& Donate 11am-9pm at Steele & Hops! *2/27: Dine & Donate ALL DAY at Tomatina! *12/16: 8th Annual Mixed Greens Mixer Holiday Party! *12/5: Field Trip to Sebastopol Ballet’s MicroNut Nutcracker! *7/12: Last get together of this school year…please come on out & support! Dine & Donate at Chipotle! *7/8: Graduation Celebration & Family Movie Night at the OG! 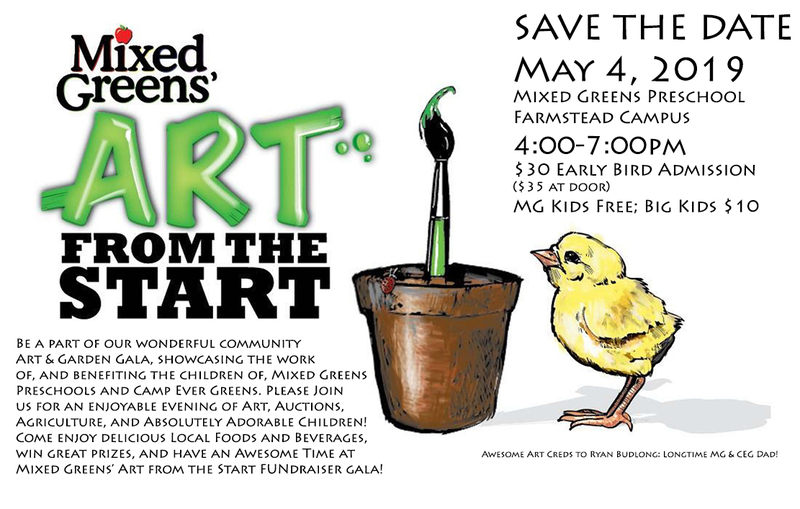 *6/30: End of Inaugural Year Farmstead Family Party at MyGym! 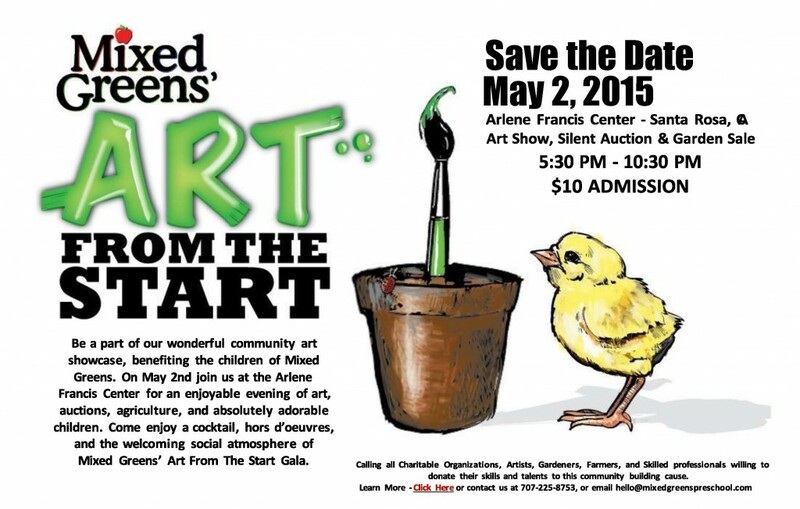 *6/17: Art from the Start at the Arlene Francis Center! Our biggest event of the year! 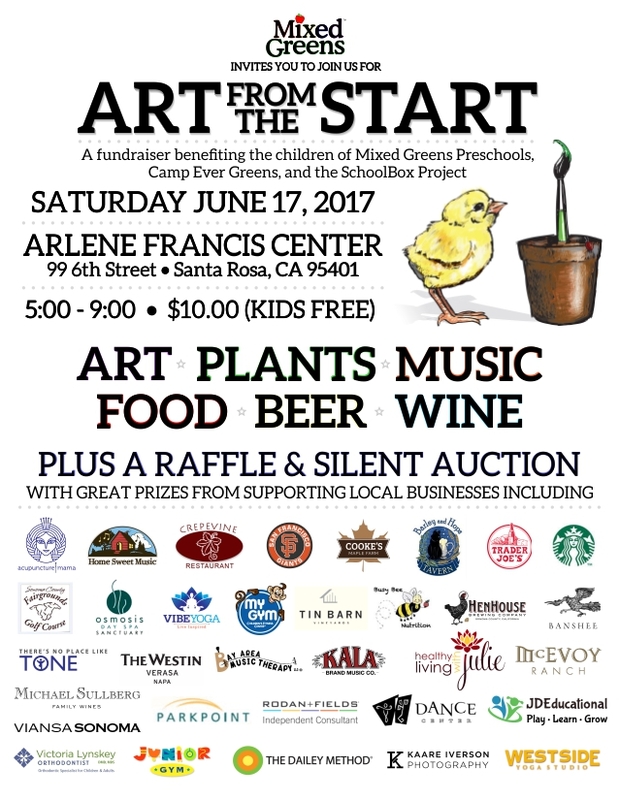 Children’s Art & Garden show, Raising funds for both Mixed Greens Preschools, Camp Ever Greens, and The SchoolBox Project. Please come out and support! *4/3: Field Trip to the Environmental Discovery Center at Spring Lake! 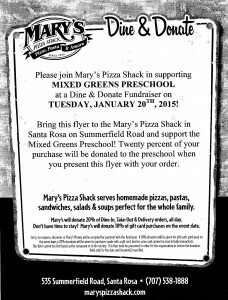 *2/22: Dine & Donate at Mary’s Pizza Shack Downtown on 4th Street! *2/1: Grand Opening of our Second Location: Mixed Greens at the Farmstead! *12/19: Field Trip to Le Studio Danse – Nutcracker Ballet Workshop! *12/17: 7th annual Mixed Greens Mixer Holiday Party! *11/3: Dine & Donate at Bibi’s Burger Bar on 4th Street! *10/13: Parent Ed. Night: “From Power Struggles to Postive Solutions,” with Maria Freebairn-Smith of Restorative Resources. *10/7: Field Trip to The Great Peter Pumpkin Patch in Petaluma! *9/12: Dine & Donate at Mary’s Pizza Shack on Summerfield! 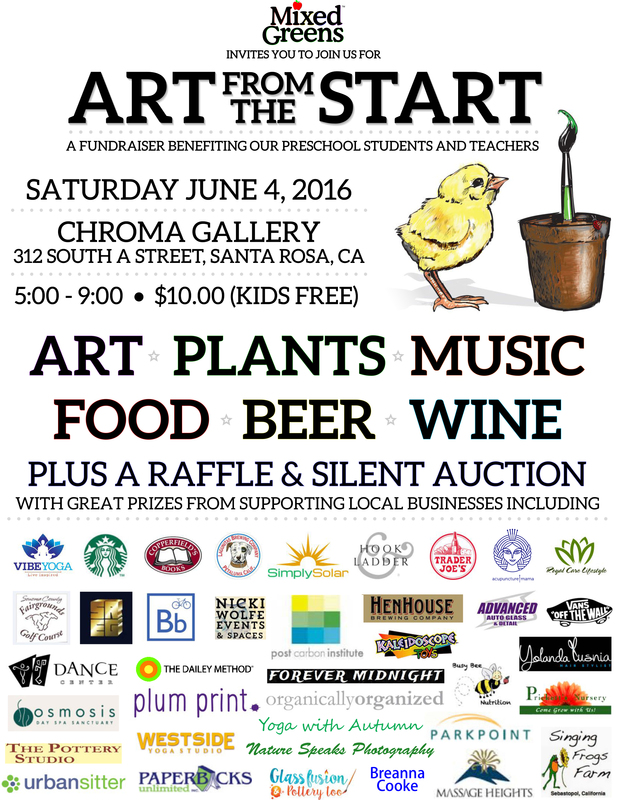 *6/4: Please join us for our 2nd Annual Art from the Start art show and garden sale at the Chroma Gallery in the SofA arts district. 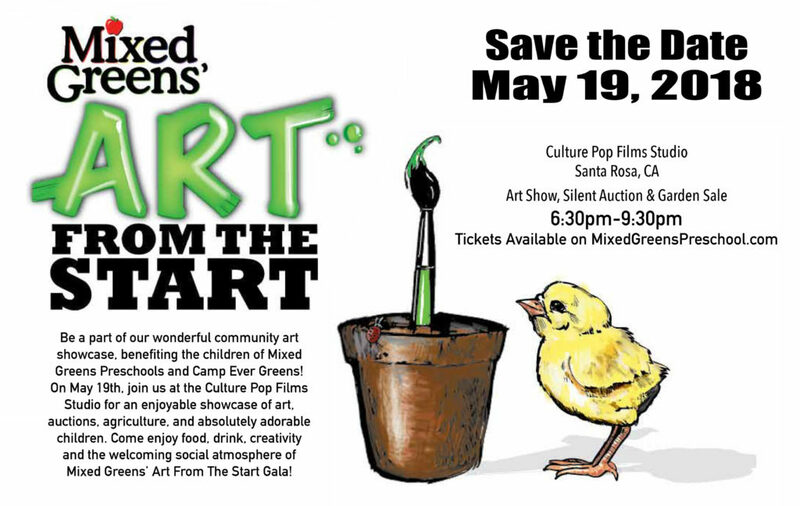 Our biggest event of the year, showcasing the children’s work from the Studio and Garden, while benefiting the growth of our school and beautification of our community…please come support and enjoy…spread the word! *3/30: Dine & Donate at Mary’s Pizza Shack on Summerfield! *3/22: Field Trip to Snoopy’s Home Ice! *2/18: Dine & Donate at Chevy’s in Railroad Square! *12/2: Dine & Donate at Johnny Garlic’s! Dinner Party…Spread the word (and the flyer)! *11/18: Parent Ed. Night! Jennifer Monin, a specialist in Herbal Medicine, Acupuncture and Yoga from Farmacopia will be joining us to share tips, recipes and strategies on how to keep our families (naturally) healthy during this cold and flu season. *10/28: Field Trip to the Great Peter Pumpkin Patch in Petaluma! *10/10: Please join Team Mixed Greens as we Light the Night against cancer! *9/15: Please participate in our first Dine & Donate fund raising event of the year! Print up this flyer and present it all day at Mary’s on Summerfield, and Mixed Greens gets 20% of your tab…spread the word! Current MG Parents: Please meet us in the party room at 6:00pm for our first Parent Planning Meeting! *2/3: Ice Skating Field Trip to Snoopy’s Home Ice! *1/28: Parent Ed Night! Consistent Parenting with Dr. Aaron Jacobson. 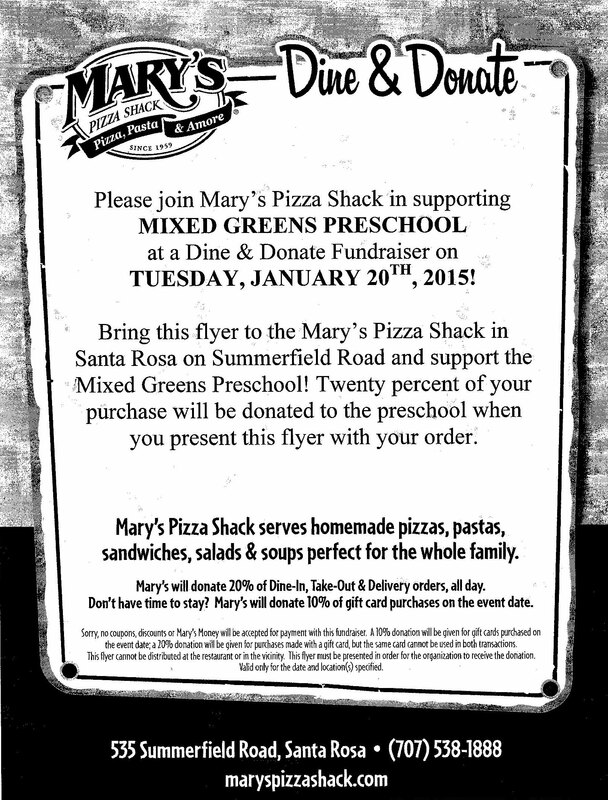 *1/20: Dine & Donate at Mary’s Pizza Shack! Print up this flyer and bring it in anytime, all day! *12/20: Mixed Greens Mixer 5th Annual Holiday Party! *11/20: Parent Ed. Night! Raising Children in the Digital World, with Todd Sarner of Transformative Parenting. *10/22: Field Trip to Peter Pumpkin Patch! 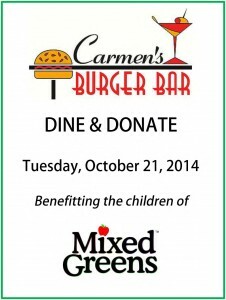 *10/21: Dine & Donate at Carmen’s Burger Bar! Print up this flyer and bring it in anytime, all day! *10/11: Join Team Mixed Greens as we Light the Night! *9/10: Field Trip to the National Heirloom Exposition! *7/25: Graduation and Family Movie Night! *7/23: Field Trip to the Farmer’s Market! *7/19: 9-2, Mixed Greens Market!!! Rummage Sale, Raffle, Bake Sale, Art Gallery, Carnival!!! Our biggest FUNdraiser of the year, supports Program Expansion and Teacher Retention. Please join us! *7/10: Field Trip to Downtown Santa Rosa Library by City Bus! 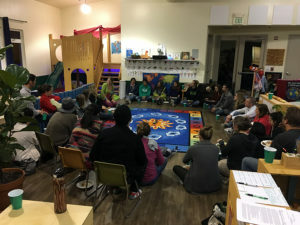 *6/10: Parent Ed Night: Parenting by Connection with Robin Setchko of Hand in Hand. *4/8: Field Trip to Singing Frogs Farm! *4/1: Dine & Donate Dinner Party at Mary’s Pizza Shack! *12/14: 4th Annual Mixed Greens Mixer Holiday Party! *10/29: Field Trip – Peter Pumpkin Patch! *10/12: Join Team Mixed Greens as we Light the Night! *7/15: Field Trip to Sutter Hospital! *7/13: Mixed Greens Market!!! Rummage Sale, Raffle, Bake Sale, Garden Stand, Carnival…come play! *6/26: Field Trip to the Redwood Empire Farmer’s Market! *6/12: Field Trip to Cultivating Impact Farm! *3/27: City Bus Field Trip to the Santa Rosa Central Library! *2/27: Field Trip to Rohnert Park Gymnastics! *1/9, 1/23, 2/6, 2/20 6-8pm: Positive Parenting Program (Triple P) Series – Parent Ed Nights, Child Care available! *11/28: Moms’ Massage Night at Jessie Jing’s Santa Rosa! *11/10: Teachers attend Green Preschools Open Forum at NCC in Santa Clara! *10/17: Field Trip to the Tolay Lake Fall Festival and Pumpkin Patch! *10/6: Join Team Mixed Greens as we Light the Night against Cancer! *10/4: Field Trip to Cultivating Impact Farm! *9/20: First Parent’s Group Meeting of the year! *7/21: Mixed Greens Market!! 9-2 Join us for a huge multi-family Rummage Sale, Awesome Prize Raffle, Bake Sale & Lemonade Stand, Local Artisan Tables, Face Painting, and Mini-Gold by Russ Scarola! Fun for all, and all benefits going to Mixed Greens program expansion and Teacher Retention. Come play with and support us!! *7/13: Officer Jennifer Jones from the SRPD visits Mixed Greens to show us that a girl can do a tough job, as well as teaching us about police work and safety issues! *6/20: Mixed Greens Summer Solstice Salad Party…Kick off Summer with us at Fresh Choice Santa Rosa! 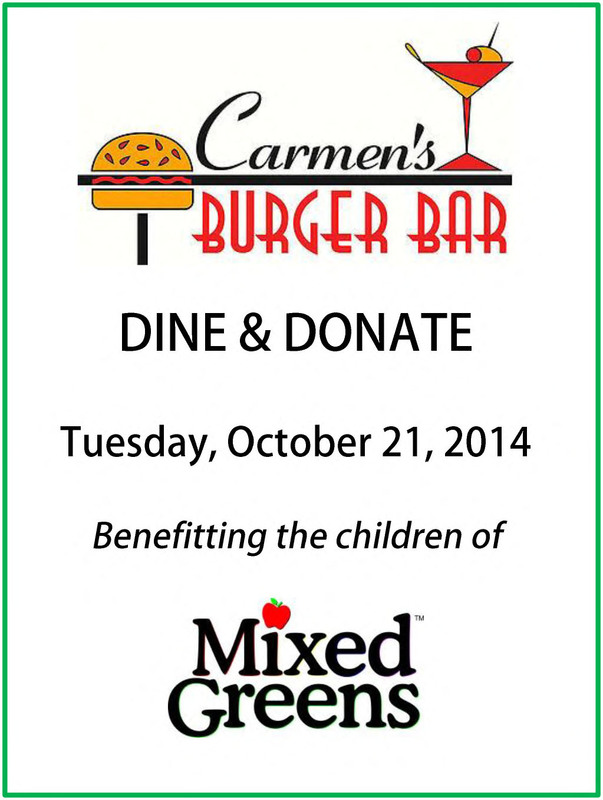 Enjoy a healthy meal while also raising funds for Teacher Retention and Program Expansion. Dinner Dance Party on the patio from 6-8 with live music by Rondre! * Time for a pre-Valentine date! Another Parents’ Night Out brought to you by our teachers! Friday 2/10, from 6-10. 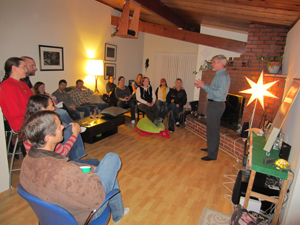 * Join us for our first Parent Ed night of 2012, with Dr. Aaron Jacobson, teaching us about Ages & stages: Is That Normal? Friday, 1/20 from 6-8. * Enjoy a Night Out on the Town while our teachers enjoy a night in with your kids! Friday, 12/9 from 6-10, Parents’ Night Out! * Join us Thursday 11/17, from 6-8pm, for our first ever meeting of the Friends of Mixed Greens Parent Group! *On Monday 11/14, at 10:30, we will be visited by a San Francisco Police officer! He will teach us about Police Work, Stranger Danger, and Weapon Safety. 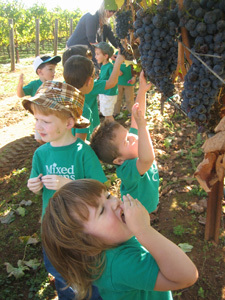 *We’re SO Sonoma…Our first field trip this year is to Field Stone Winery, where the kids will get to see some grape-crushing, wine-making action! We will head to Healdsburg on Thursday 10/13 for the children to learn more about this vital aspect of the community that they live in. *Join us for our First (& Most Important) Event this year: Light the Night! Recognizing your spirit of awesomeness, and knowing how good it can feel to do something for others, I’d like to invite you to join and support Team Mixed Greens in the Light the Night Walk, benefitting the Leukemia & Lymphoma Society, in Santa Rosa on October 15, 2011. This is a really magical event, in which participants carry illuminated balloons as they walk together to raise funds to fight against these diseases that affect patients of all ages (sadly including many young children). It is a really beautiful event, and one that the kids can feel very proud to be a part of. Jadon has been “walking” since he was 3 months old! This is an event close to my heart, after losing my brother Mark to Leukemia. This is an event close to all of us at Mixed Greens, as our old friend Cecilia is also survivor of Non Hodgkin’s Lymphoma. Let’s give our kids the chance to know how good it feels to do something important by helping others! Please spread the word to gather support against these diseases and join us in the walk if you can! Click here for more info or to join our team…let’s Light the Night and the futures of families together! *In the spirit of the season, we will be revisiting Peter Pumpkin Patch in Petaluma on Thursday 10/27. We had so much fun last year taking tractor rides, milking cows, digging potatoes, and of course picking pumpkins, that we had to go again this year! In fact, our trip last year inspired us so much that we used the pumpkins from that farm to create our own little patch here at school! *Let’s celebrate our first fabulous year of Mixed Greens together as we kick-off summer with a Family Movie Night on Saturday, July 30, outside on the Mixed Greens Playground! Potluck party begins at 5:30, movie begins at sunset. Enjoy the friends you’ve made, meet the friends who will be joining us soon! *Come hang with us on Saturday, July 23, from 8:30-4:00, for our Mega Multi-Family Mixed Greens Garage Sale! All proceeds to benefit our Teacher Retention & Education fund (they, and your child’s education, are worth it!) Rummage sale, Face Painting, Bake Sale & Lemonade Stand, plus a Raffle for awesome prizes…a good time to be had by all! Come help us make it happen! *Please join us for our most important Parent’s Ed Night yet! On Wednesday, July 13, from 6:15-8:00, Mill Creek Safety presents: Pediatric CPR and First Aid Training. Free to you, priceless to your children…Don’t miss it! *We are proud to present the POSITIVE PARENTING PROGRAM (TRIPLE P) Social/Emotional Seminar Series this May! Parenting can be rewarding and enjoyable. It can also be demanding, frustrating, and exhausting. · Workshop 1: The Power of Positive Parenting gives parents skills to help their children learn and develop self-control through positive discipline. It also helps parents develop realistic expectations and learn about taking care of themselves. · Workshop 2: Raising Confident, Competent Children includes strategies to help children learn respect, become independent problem solvers, and to get along with their friends. · Workshop 3: Raising Resilient Childrenhelps parents understand children’s emotions so they can cope well with negative feelings and difficult situations. 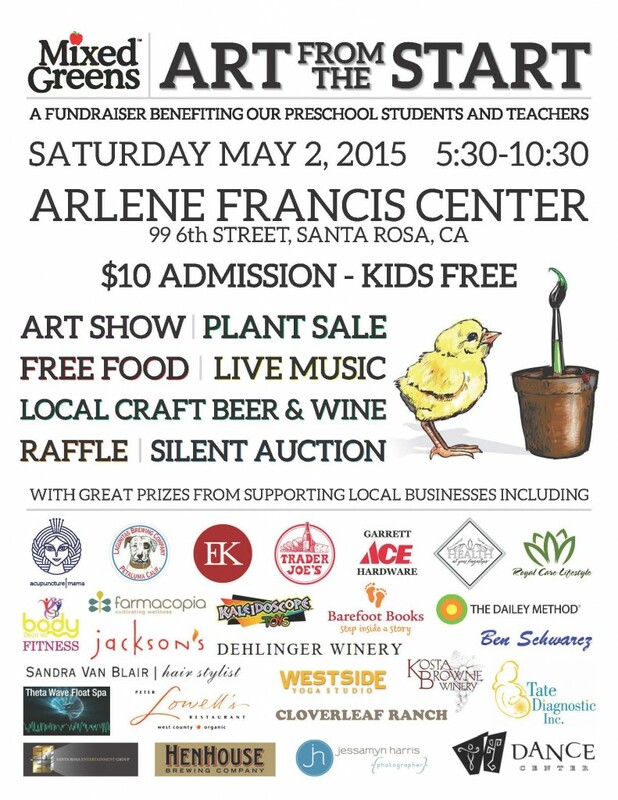 * We are also planning a Family Field Trip to Singing Frogs Farm in Sebastopol on Saturday, May 14, from 10-12! Paul, the farmer says: We’ll explore our chickens and duckies, our sheep and llama, the many insects, birds, turtles and other wildlife on the farm as well as the farm fields themselves! We’ll flexibly follow the energy of the preschoolers to see how long to take it. *First Ever Mixed Greens Mamas Night Out! Come hang with us on Wednesday, April 27, from 6:30-9, for Ladies’ Night at The Pottery Studio, on 4th Street in Santa Rosa! Contact Starr for more details. *Join us Tuesday, February 15, as we get a visit from firefighters with their firetruck! It is so important for young children to understand that there is a real person (a mommy even) underneath all that sometimes scary firefighter gear, and to learn about fire safety, so please be there! We will begin at 10:15 in the classroom with a presentation by our fabulous firefighter, Tristan’s mom! Then, weather permitting, we will walk across the street to the parking lot of Doyle Park to check out the truck. If we get rained out (cross your fingers! ), we’ll still meet in the classroom, but will save the truck for another time. * On Wednesday, February 2, we will offer the first of our Parent Education Nights, an evening with Nutritional Consultant, Amy Hudgens. This should be a fun and informative event, and we hope to see you all there! Check the blog entry, Nutrition Night! yum. for full details! *Join us Saturday, December 11, for our First Annual Mixed Greens Mixer, celebrating and joining Mixed Greens families, past and present! *Our First Field Trip will be on Thursday, October 14, when we head to Petaluma to learn from the farmers at Peter Pumpkin Patch at the Spring Hill Cheese Company!